The ground at the proposed Invasion site has been as hard as rock this Summer. I have therefore been reluctant to continue excavation work on my own after such an intense period of activity at the Inquiry between March and July. In fact it is fair to say that I had been mentally shagged by those employed by the Highways Agency, who sought to discredit every pience of evidence presented, without any apparent moral responsibility to seek the truth. Standing on your own for three months in what amounts to a court, because you believe in something, is not easy. I am confident that the Inspector is not only a just man, but an honest one, who will see through the charade presented by paid experts, each seeking to justify the other's reports. Now that the experts have gone home to contemplate their credibility the documents remain posted at this site for all to read. I remain here to continue my work, as promised to the Inspector at the Inquiry and I think that if I believed that those at Wessex and Marc Gardiner had treated me fairly, I would probably have left the decision to the Inspector. However I decided a few weeks ago to look for another Norman boat, because as stated at the Inquiry there are many there, all it takes is time and effort for me to locate them. I have now located what I believe is a second site which may contain evidence which directly links this site to the Norman Invasion. This time I am not going to be foolish enough to believe that I will get independent confirmation from archaeologists employed by the Highways Agency. I am therefore seeking outside assistance from people who have excavated ancient boat sites before. I have excavated an area in a different part of the marsh, at a lower elevation than the previous site, about a meter square. The first thing that was seen was a number of triangular stain marks. These can be seen here. Using a fine pick I started clearing the soil according to colour and feel. Slowly a form appeared that was hard and appeared in all respects to be an iron flange about 5cm wide and 70cm long. A second flange was found approximately 55cm from this and parallel to it. A dark section appeared to connect the two flanges so that looking at the site there was evidence of material around three sides of an upturned U shape. As the area was exposed the colour of the excavation darkened from light brown soil to black as I excavated in the center of this area. No resistance was found until a leval of black material was found. This material might have at one stage have been wood, but no recognisable grain could be seen. None the less it had a soft texture like submerged wood, but looked as if it might be a coating of some kind (possibly pitch). At this time I cannot say what it is, but the layer marked a definable barrier to further clearance. In one corner of what now looked like a central pit, I excavated further through the black layer, to find a grey silt over peat. 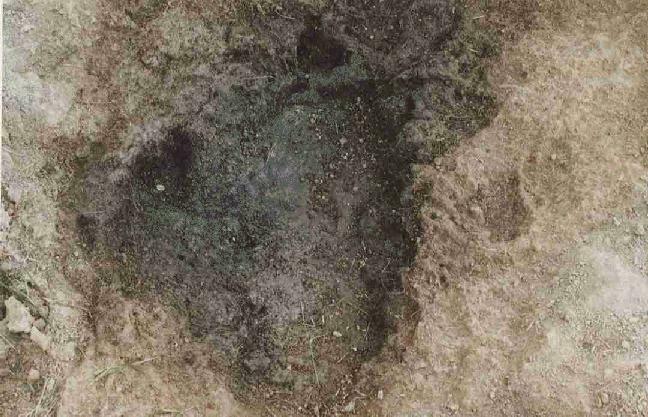 This marked the total depth of the excavation, since augering close by showed that this marsh has peat deposits of many tens of feet, once the grey silt finished. Clearance over a number of days revealed what appears to be a black wooden timber appx 10 - 12 cm square, with a hole cut into it almost half way between the two struts. When excavating the site the hole appeared during the excavation, showing that it had not filled with sediment. A circular object was placed over this area, and this appeared to be attatched by triangular brown objects, in a great degree of decomposition. These were hard and looked like metal, nut with no metalic response. At the Inquiry much had been made about the fact that iron objects would "undoubtedly retain their magnetic qualities". This excavation will undoubtedly confirm that the experts in question were speaking out of the wrong end of their bodies. These remains are undoubtedly wooden, with metal decomposed features. However no magnetic response at all was found, even though hard objects remain which look like metal. In order to double check this point, because Council acting for the Highways Agency made such a song and dance about it, I decided to check with the conservation department at English Heritage. They confirmed that where a site has been exposed to rising and lowering of the water table, together with salt (from the sea) and oxygene, the chance of magnetic response after 1,000 years was very slim- especially in East Sussex, where the soil is known to be acidic. I have to ask how is it possible to be told this, and yet experts employed by the Government to put a road through, deny this in a Public Inquiry? Having cleared the left hand metal flange, the centre section with the hole and the central pit area, where further triangularmarks were found, I started work on the right hand side, where the second flange could be seen. This turned out to be very interesting, because the flange appeared to have an object on top of it, which may have a chain attatched to it. Only when I received the photographs back from the developers did it occur to me that the metal object took on the form of an anchor, although the exact form was partly missing. However of greater interest to me at the time was a metal flange which appeared to run along the inside of the excavation, which had a small plate attatched with a very clear black rivet through it. Again no metal response, but none the less man made and confirmation that something of immense interest lies in this site. Having discussed briefly the excavation the following photos show what is there. In many ways the photographs themselves are a great dissapointment because they do not do justice to the work done. I am not a professioal photographer and the dark colour of the suject matter (mostly black) does not reproduce well. The brown iron colour is not sufficiently bold enough to register in the light and much of the metal colouring has not been discernable to the scanning process (technology HuH:(). There are two photographs. 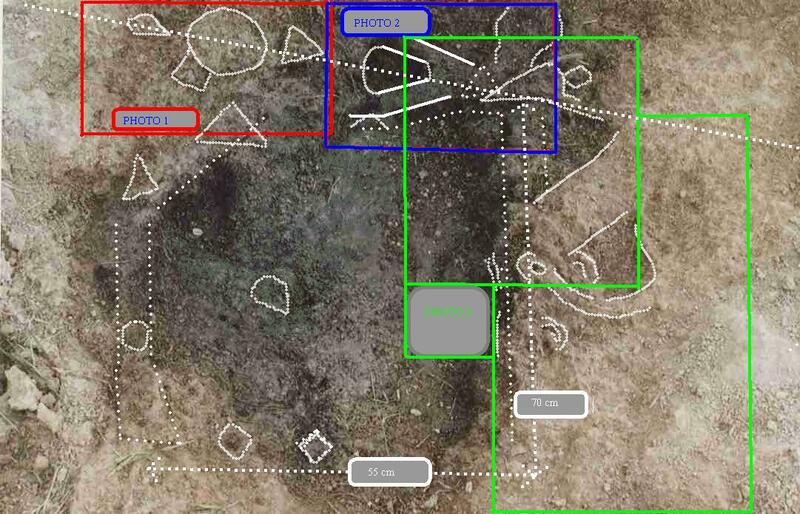 The first shows the layout of the excavation with coloured squares, showing the areas covered by other photographs, colour coded red, blue and green. It is necessary to look at these and then study the complete picture without the graphics.